The above info came from hamstarz, and was edited by yours truly (contact me). The image came from Movies. Laura's birthday is coming up, and she hasen't been caring for Hamtaro as much as she used to. Hamtaro wishes that Laura can understand what he says so he can tell her that she hasen't been caring for him. 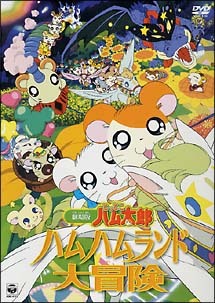 Hamtaro and the ham-hams later learn about a magic sunflower seed. Who ever eats it will get one wish granted. Hamtaro wants that seed so he can wish for Laura to understand him. So he and the ham-hams go to theme park like Ham-Ham Land to look for the magic seed. Also, the ham-hams come here for some enjoyment. However, there's an evil hamster named Devil Ham who wants the same seed Hamtaro's looking for... most likely for an evil wish.